The long and winding road that leads to the Octagon’s door this Saturday at UFC 145 has been an arduous 13 month-long journey. 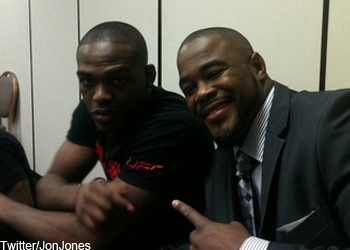 If you were to ask Rashad Evans, the trouble actually began all the way back in August of 2009 when Jon Jones became a member of Greg Jackson’s team against Evans’ wishes. Jones’ addition came three months after Evans was put to sleep by Lyoto Machida at UFC 98. By the time he regained consciousness, Evans discovered his undefeated record and light heavyweight title were a thing of the past. “Suga” would once again enjoy the sweet taste of victory in his next two bouts, with his unanimous decision win over Quinton “Rampage” Jackson at UFC 114 earning him the opportunity to reclaim his throne. Unfortunately for Evans, then-champ Mauricio “Shogun” Rua suffered a knee injury which postponed their matchup. Evans was eventually slated to challenge Shogun for his crown at UFC 128, but an injury forced him out and opened the door for Jones to step in and become the youngest champion in company history. At the time, Evans gave his teammate his blessing to serve as substitute but things quickly soured between the former BFFs. According to Evans, coach Jackson promised they would never have to fight each other when he initially brought “Bones” on board. Evans then took Jones under his wing and the 205-pounders pinky swore they wouldn’t scrap under any circumstances. However, during a March 2011 interview, Jones suggested a teammate vs. teammate showdown could go down if that’s what UFC president Dana White demanded. Evans felt disrespected by the comment and left Jackson’s camp shortly after to formulate the Blackzilians in Florida. After new alliances were solidified and their shootout was confirmed, just as with their rocky relationship, nothing seemed to go smoothly. A hand injury suffered by Jones nixed their initial encounter at UFC 133, then Evans had his right hand surgically-repaired last fall and couldn’t answer the bell for UFC 140. Which leads us to Saturday, where the friends-turned-foes will rekindle their white-hot rivalry in Atlanta. The time for swagger jacking and slinging insults is done and the only thing left to do is close the cage door. They certainly took the scenic route in getting here, but the long and winding road finally comes to an end at UFC 145. Thankfully, nothing significant was lost along the lengthy voyage – outside of a friendship, of course.